Math Summer Slide | What is ML Reading? Yesterday, I confessed my negligence exploring math concepts with ML this summer. This evening, I decided to cram it all into one night utilizing a series of picture books called MathStart. We read 3 tonight. The level one books describe basic math concepts ML already mastered. The level 3 books were beyond ML’s mathematical comprehension and a stretch for me. 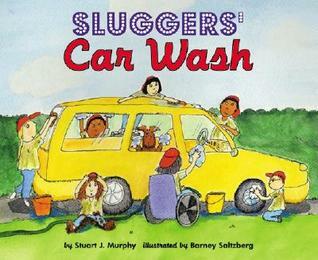 I didn’t know this until we started reading the book, Slugger’s Car Wash by Stuart J. Murphy and illustrated by Barney Saltzberg. While his friends do the hard labor, C.J. is sitting in the shade counting change to customers. Instead of focusing on change, I asked ML to read me the numerals written in dollars and cents. If I checked out the car wash book earlier, I could have seamlessly eased some math concepts into our evenings. For example, the tips at the back suggested providing ML with a catalog and some fake money to spend. She decides what to buy and counts back the change. Next year, I pledge to slip in math concepts throughout the summer. In the meantime, ML loves the catalog Mindware; and we just happened to receive a new one in the mail yesterday. I didn’t even open the other level 3 book. It was about hamsters, cats and protractors. . . I’m not ready to go there. My summer slide is actually a twenty-year-slide. I’ll be relearning math for the next twelve years. In the meantime, I’ll find some level 2 Math Start books. Not sure why I neglected to bring one home. They were probably checked out. This entry was posted in Picture Book and tagged Barney Saltzburg, Math, MathStart, Mindware, Stuart J. Murphy by mlreads. Bookmark the permalink. Great idea about the catalog and money activity! Loved the bit about the twenty year summer slide. I can relate! I bet I can guess how old you are. Weren’t we going to meet in Chicago to celebrate our 40th birthday? Yes! That would be fun! Next November?